What a surprise! I was in a large stationery and office supplies store the other day and there were three new mechanical pencils on display. Three new models offered on the local market! Astonishing. Now, two of them were BICs and I’d seen them on overseas websites, but the third was a Papermate that had previously escaped my attention. I wouldn’t normally have purchased any of these new mechanical pencils, but the Papermates were very cheap, and it was such a red letter day I decided to hand over some coins and get a couple. I’m not going to review it, but here’s the Papermate Pacer Mini. Pacer Mini with clear transparent body and coloured translucent end section/pocket clip. Mini eraser under the end section. The Mini is 114mm long with the sleeve retracted, and the rubber grip is 11mm diameter at its widest point. Well anyway, at the price it was for sale at, it seems a useful little offering for the pocket or purse. Now, I decided to take the barcode sticker off one of my Mini’s and it left a horrible sticky mess behind. I hate that, particularly because there’s no need for it. Anyway, in the past I have usually used a citrus based cleaner to remove the goo but I remembered that back at the beginning of the year ‘Anonymous’ left a comment on my Guestbook that a good quality eraser like Staedtler Mars Plastic was ideal for removing this sort of label goo. Well, they were right. It did. Nice and easy. I tried a soft PVC-Free eraser first and it wasn’t much good, but then Mars Plastic took it off no worries. I think the hardness is probably the key rather than the actual eraser material. So next time this happens to you, I recommend trying a vinyl eraser. 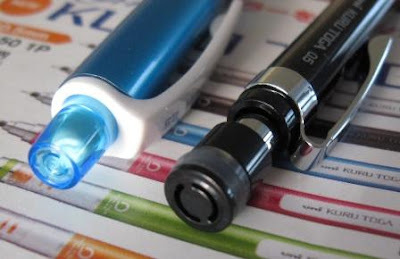 For ink-folk there is also the BP version, the Sport Mini, which has a reverse sort of colour scheme to the Pacer Mini, namely coloured transparent body and clear end section/pocket clip. 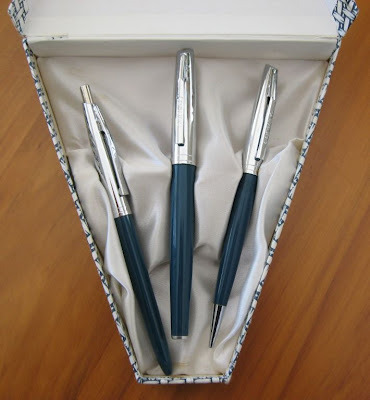 The late 1940’s through to the late 60’s was a tumultuous time for writing instrument manufacturers as the ballpoint pen quickly began to enjoy widespread commercial success. Patent battles, poor designs, quality control disasters, product recalls, smear campaigns – it was all on for young and old. 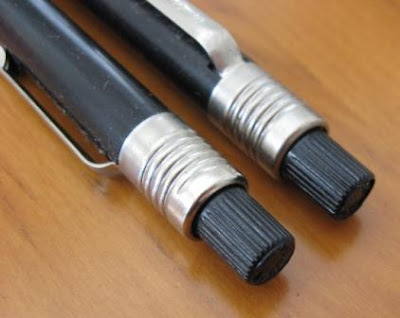 Many industry giants were mortally stricken by making a wrong a call over the ballpoint pen, and in particular the mighty Eversharp were dulled, blunted and ultimately snapped and broken by their foray into the world of ballpoint pens. Another brought low by the ballpoint was Conway-Stewart. Just look at this junk from this once respectable name. 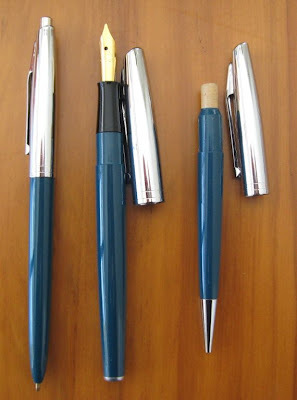 It’s a triple set, from left to right being ballpoint pen, fountain pen and mechanical pencil. Despite the tear on the inside of the lid I believe this set is NOS (New Old Stock). 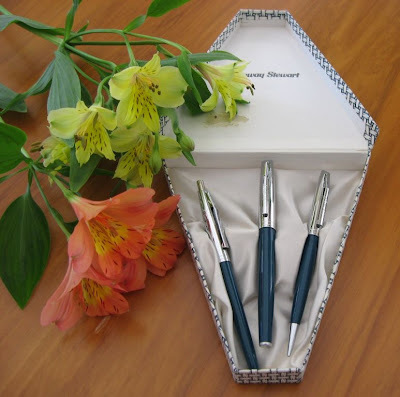 The trapezium shaped cardboard presentation box has a cloth interior and looks quite coffin-like in the photo, which is totally apt. The three of them actually look reasonably smart, with bright shiny chrome upper bodies and plastic lower halves. But things change the instant you pick them up. For a start, they are absolute feather-weights, the mechanical pencil weighs in at a puny 9 grams, and all three of them together weigh only 29 grams. I’ve got mechanical pencils that alone weigh almost as much, e.g. the Pelikan D800 Souveran and the Parker Duofold Centennial both weigh 27g each. The chrome top half of the mechanical pencil no longer fits securely onto the lower plastic half of the body. I will be kind and assume that there has been some shrinkage over the years, but now the metal top half just falls off under its own weight if you turn the pencil upside down. The pencil is a tip twist using 1.18mm leads as you would suspect. Trust me, the ballpoint and fountain pen are equally uninspiring. They are just not what one expects from a name like Conway Stewart. I don’t know the model numbers of these pens or when they were made but I assume it was sometime in the mid 1960’s to the company’s final demise in 1975 during which period the companies products slid many rungs down the ladder of quality. However, if you do happen to know the model details I would be interested in knowing. 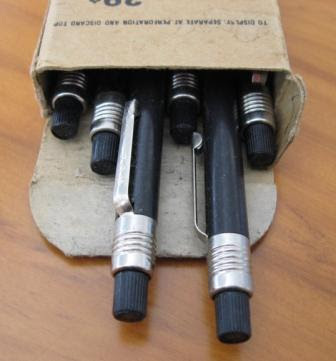 The box has Conway Stewart printed on it, but the only marking on the writing instruments is “Conway” and “UK” stamped into the pocket clip. To be honest, I’m not really sure of the proper name for this mechanical pencil. 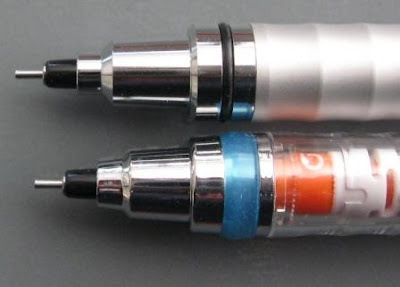 First there was only the Kuru Toga, model M5-450 1P (or M3-450 1P in 0.3mm) but now there is a second model of mechanical pencil using the Kuru Toga ‘turn engine’, the M5-1012 1P. This new model is variously referred to as ‘high-grade’, ‘high specification’ or ‘2nd generation’, but high-grade seems to be the most common translation of Japanese websites so I’ll run with that. I guess it makes the 450 series Kuru Togas ‘original’. 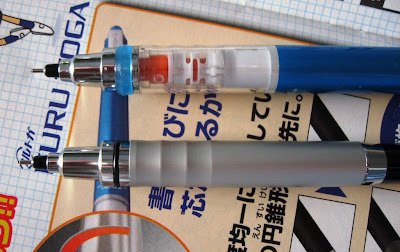 This article is mostly a quick comparison with the original Kuru Toga rather than a proper stand alone review, and should be read in conjunction with my original Kuru Toga posting. At a quick glance the High Grade and the Original Kuru Toga don’t share many components other than the name and presumably the same internal Kuru Toga “turn engine” mechanism. You can see the differences in the pictures below. The tip sections look similar but they are not the same. Different grip sections, main bodies, pocket clips, end sections, etc. Clearly the extra metal components of the High Grade mean it should last a little longer. At 15g the High Grade Kuru Toga is a medium weight mechanical pencil and about 5g heavier than the Original, but really neither of them are going to weigh your hand down. I expected the High Grade to be balanced towards the tip but it isn’t really, which was a little disconcerting until I got used to my expectation being incorrect. The metal grip section of the High Grade is sculpted like the Original, but it’s a very slippery surface finish and I think the clear plastic of the Original actually provides a better grip. Lead advance is achieved by a normal push top ratchet mechanism. Ten clicks will get you about 6mm of 0.5mm lead. It’s only small and emergency use, but I really like the black eraser. Black pencil, black eraser, full marks to Uni. 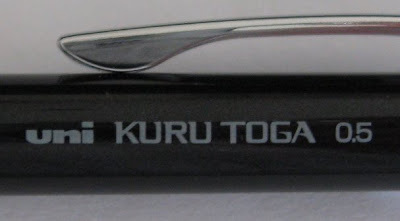 The High Grade Kuru Toga is simple marked Kuru Toga. 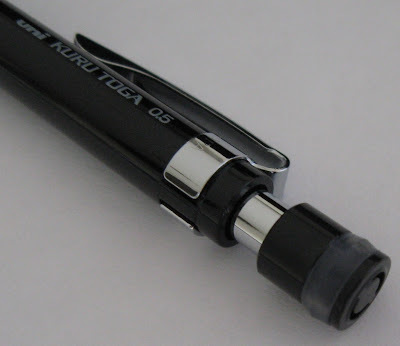 Is the Kuru Toga a draughting mechanical pencil? (Or drafting pencil as much of the English speaking world says.) I have seen it advertised on some websites as a drafting pencil, so let’s examine that idea. The lead sleeve is a thin metal pipe, but only about 2.75mm long. That’s a bit on the short side - 4mm is the usual length for mechanical pencils designed as drafting pencils. Quite a few people are very demanding of their precision technical mechanical pencils and the Kuru Toga has two features which might not satisfy exacting standards. Firstly the tip section steps out to full diameter quite quickly and I’m sure some folk would say it interferes with their line of sight to the lead. 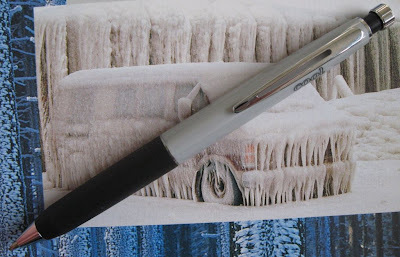 Secondly the turn engine means there is a small amount of vertical movement of the lead as you press down on the paper. It’s only a very small movement, but it’s different from normal lead cushioning and I know from previous comments that some of you will not find this acceptable. When you use a 0.5mm (or 0.3mm) pencil for drafting you usually hold it perpendicular to the paper so that the lead diameter is the width of the line. 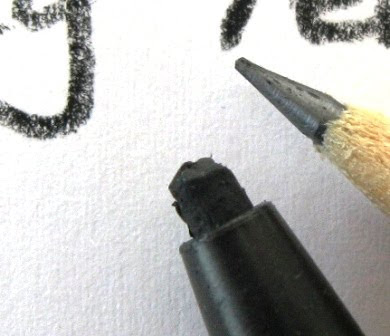 If you hold your pencil perpendicular to the paper then you never get a sharp or chisel point on your lead and the whole concept of the turn engine has no purpose, it’s a nullity. Lastly, as far as I can see, Mitsubishi Pencil don’t claim it as a drafting pencil. So, for my money, there is no question, the Kuru Toga is not a drafting pencil. It may have the general form of a mechanical drafting pencil, but it is not a drafting pencil. Another question – How long will the turn engine last? The turn engine is a mechanism of toothed plates engaging and disengaging, so obviously there must be some wear, and thus the kuru toga will have a life expectancy of x-million operations before the teeth wear and jam or just don’t turn anymore. How many is x? Best Points – Turn, turn, turn. Not So Good Points – Slippery grip. Dimensions – Length 146mm, diameter 10mm at widest part. Balance point about 70mm up from the tip. The pencils are very basic. You twist the top knob around to advance the lead, and it’s obviously intended as a propel-only screw mechanism, although you can wind backwards and then force the lead back up inside. I assume it was meant to be a disposable mechanical pencil and that you cannot refill the lead once it is all used up. 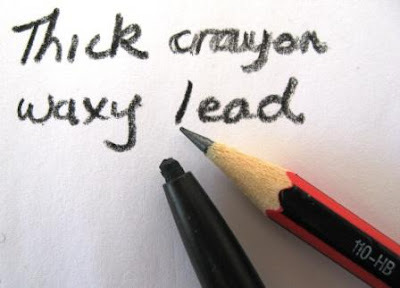 The lead itself is not a graphite lead, rather it is some sort of waxy crayon type lead, roughly about 3mm diameter. It is a good dark black colour. 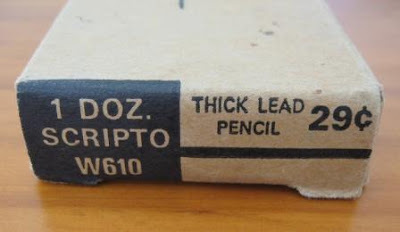 I guess this pencil was sold for durably marking difficult surfaces, an alternative to today’s felt tip markers? A couple of years back I did a bit of a survey of what pencils were available in my little corner of the world. Earlier this year I thought I might update that survey, but then I thought, “Nah”. The concept kept nagging away at me, and eventually I weakened and decided I’d do a survey of local mechanical pencil retailers. After some consideration, it became obvious to me that my retail experiences mostly occur in a fairly small well defined geographical area. It’s a roughly rectangular area, about 10km long north-south and about 4km wide east-west. The northern and southern borders are set by large retail shopping precincts, the eastern border is the sea, and to the west a motorway and commercial/wholesale zone tends to cut me off from the more westerly suburbia. At the end of the day, it’s got to be a pretty unusual item if it can’t be found within the borders of my retail rectangle. So, over the past three or four months, as I have conducted my usual shopping and other travels around I have taken a couple of minutes to survey the retail outlets that would normally be expected to sell mechanical pencils. In total, they comprised 6 x large Office Supplies stores, 4 x large Discount type general retailers, 10 x Bookstores / Stationers and 2 x Art Supplies / Specialist stores. In each store I noted (i) the top two brands for sale, as determined by retail frontage and positioning, and (ii) the total number of different models of mechanical pencils for sale. 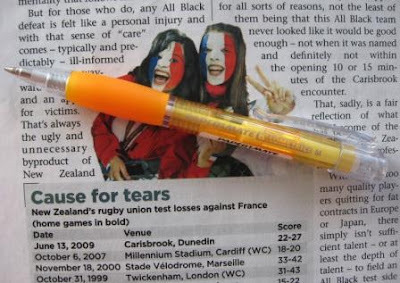 A change in lead size counts as a different model, thus a store offering Pentel P205 and P207 would count as 2 models. 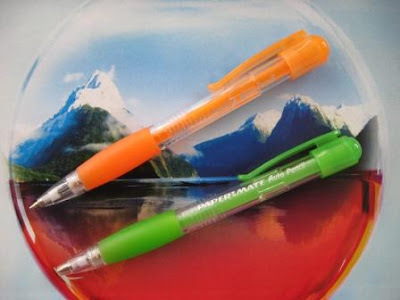 - Staedtler was the leading brand in 7 stores and the second brand in 1 store. 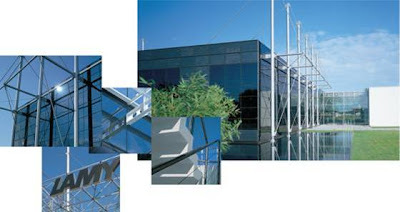 - Bic was the leading brand in 3 stores and the second in 4. 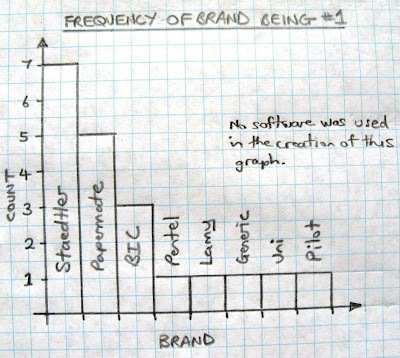 - The most common second brand was “generic/housebrand”. - The average number of different pencil models per store was 4.7, with a range of 0 to 12, a mode of 2 and median of 4. - Astonishingly, one store had no mechanical pencils at all, and another kept all theirs hidden in drawers behind the counter. The Pencilate was originally founded many centuries ago as a far flung colony of the German pencil-barons. Today the Pencilate is ruled by the 14th Pencilator, a scion of the House of Staedtler, who governs from the imposing castle Staedtler near the southern border with the friendly but aloof Separatists of the Peninsular. The Generic Hills form the main part of the northern boundary, across which are the rich but moderately populated Cowlands of the North. The western boundary is formed mainly by hills, mountains and the small but intense wasteland area known as ‘The Nothing’. 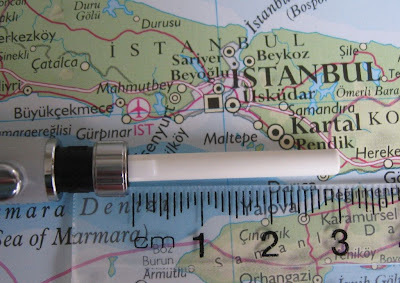 The Plains of Papermate and the Bic River form the main central part of the Pencilate. One interesting feature is the Hidden River - the outlet of Lake Lamy to the sea is by an underground, hence hidden, river. So, in case you don’t get the concept, The Nothing is the store without mechanical pencils, the Hidden River is the one with them all hidden behind the counter. Yes, in real life the nothing is a swampy no-go zone, the outlet of the lake is underground, and the aforementioned stores were nearby. The Plains of Papermate is an area dominated by Papermate retailers, and is a large central valley in real life. Staedtler was the main brand down south and just north of them three retailers had Uni as their main or secondary brand. There really is a castle, and the coast has a lot of abandoned old military fortifications. Yesterday was a red letter day for me. For the first time ever I paid money for a service associated with this blog. It never ceases to amaze me how Blogger, Wordpress and others offer all these free blogs, widgets, gadgets, etc etc etc and I'm very grateful for that. 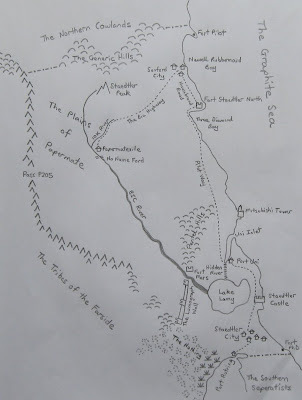 Maps are another thing that I find very interesting so yesterday I could resist temptation no longer and paid for an upgrade on my ClustrMap. You can click on the sidebar map to go to the enlarged world map just like before, but now you can click on the world map to zoom in to continent level data. A question for you. I have never really been a big fan of article labels or tags, so haven't ever created many labels for this blog. I tend to think that search facilities like Lijit basically make labels redundant. However, I'm starting to re-evaluate that theory, so feel free to tell me if you think more labels would be good, or not. I've put a poll in the sidebar if you feel like answering with an easy click. 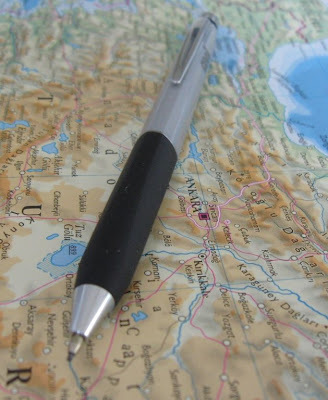 Over the past few years I have become increasingly aware of just how much the offerings of the global writing instrument brands vary from one country to another. I guess ages ago I had a rather naïve and simplistic view of the global brands, something along the lines of the brand having a basket of products with a sort of pick and mix selection of those products being offered in various countries or geographical regions by the relevant national distributors. These days my view is more along the lines of the global brand having a basket of products, as well as the various national distributors each having their own individual baskets, such that the products offered in any one country are a selection from the global basket plus the contents of the local basket. Although it is far away on the other side of the world, Turkey is an inextricable and visceral part of one of the most important events in the history of my country, and that of our ‘Trans-Tasman Cousins’. So, unusual connections to Turkey have a little extra interest for me. 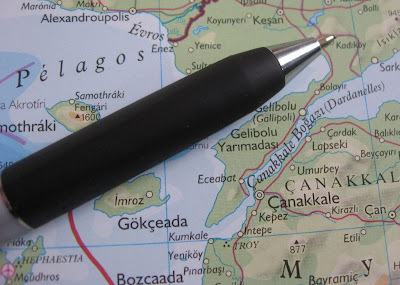 There are writing instrument manufacturers in Turkey, one of which is ADEL, a joint venture between Anadolu Group of Turkey and Germany’s Faber-Castell, but I haven’t as yet got my hands on any of their products. 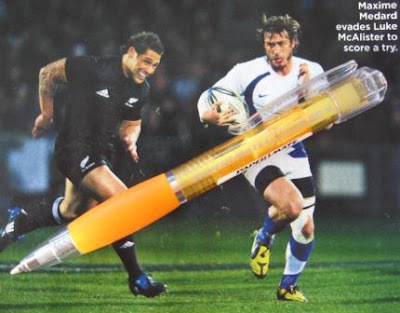 Today though I have something else of interest - it appears that there are some Turkey-only Tombow mechanical pencils. 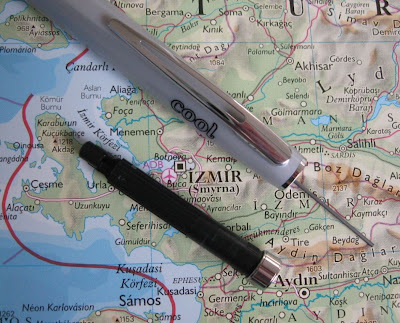 You can see them here at the website of Serve, who are an office supplies company in Turkey, and in particular a (or the) Turkish distributor for Tombow of Japan. 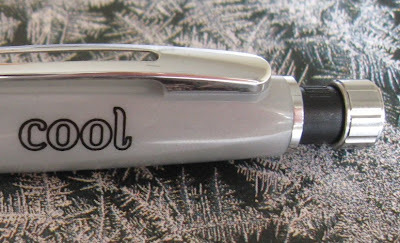 So, from Turkey, I present the Tombow Cool. 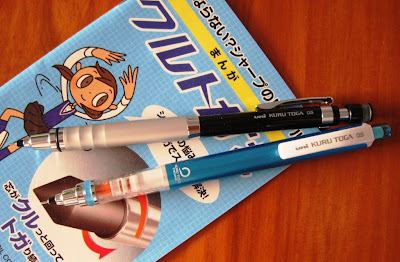 According to the Serve website (with the assistance of Google translate, and as far as I can understand it) the Tombow Cool mechanical pencil is available in seven colour options and in 0.5, 0.7 and 0.9mm lead. Mine is the metallic grey colour and 0.9mm lead. First off then, does the Tombow Cool look cool? Well I quite like its looks, and the Cool logo printed on the body does look rather cool. The combination of black, metallic grey and chrome blends nicely. 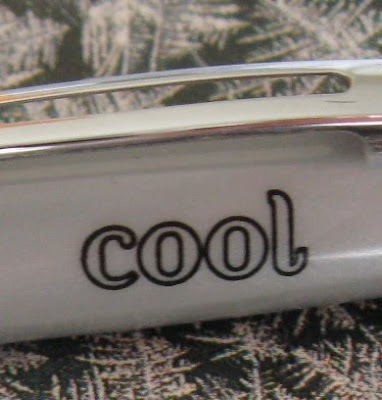 The Cool is a triangular bodied mechanical pencil. The rubber grip is triangular and feels a little wider than average. It is quite long in length, taking up over a third of the length of the pencil so you can pretty much hold the Cool wherever you like – down low close to the tip or way up for that relaxed stance. The rubber is smooth without any surface pattern and a reasonably grippy compound with a small amount of give under finger pressure. The Cool is reasonably lightweight and neutrally balanced so it doesn’t have a lot of presence in the hand. 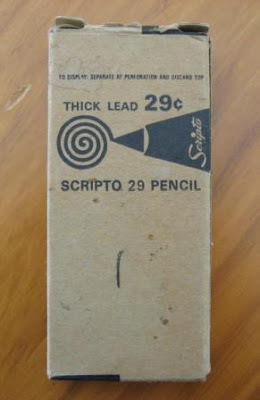 The tip section is a chrome metal cone, and the retractable lead sleeve is also a short cone so this pencil is pocket safe but clearly intended as a general writing pencil. The mechanism is a standard push top ratchet. For my 0.9mm version, ten clicks will get you 7mm of lead. The mechanism feels and sounds nice, smooth and positive. 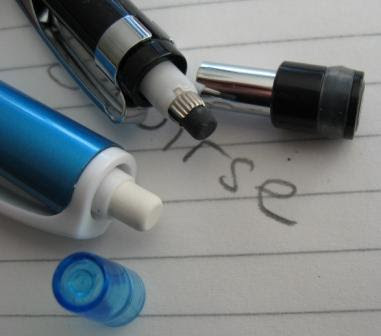 Up at the top end of the pencil, the push top button is an extendable eraser housing. I quite like the grooved chrome ring around the housing. The eraser core itself is a fairly hard white plastic or TPR and is about 4mm diameter. You can twist out about 26mm (1”) of usable length. The eraser is obviously replaceable. The entire cartridge pulls out to allow access to the lead refill magazine. The pocket clip is very smart looking. It is rather strongly sprung, almost too strong. It certainly won’t be accidently slipping off whatever you clipped it to. 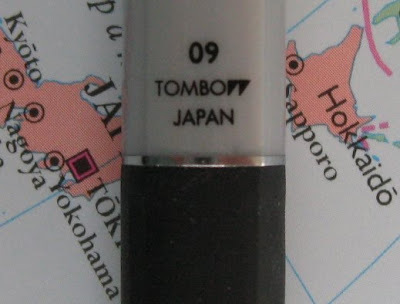 Markings on the body are minimal – “Cool” up by the pocket clip, and “09, Tombow, Japan” down near the rubber grip. Overall then this is a nice smart looking mechanical pencil and quite reasonably priced. It’s unusual origins are a little added bonus to mechanical pencil collectors. Cool is not an inappropriate name. Not So Good Points – Nothing really leaps out at me. Dimensions – Length 145mm, triangle sides about 11mm. Balance point about 70mm up from the tip. 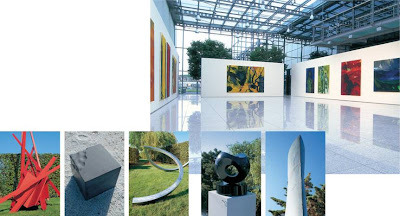 PS – if there are any collectors or regular readers out there from Turkey, it would be great to hear from you – send me an email on the address up in the blog header.